"Open In Reader View" adds a new context menu item to the page and link context menu to let you open webpages and urls directly in the reader view mode to strip away all of the clutter. In the reader view there is a context menu item to switch back to the default mode. This extension can be used for easier access to the reader view mode or for pages that the reader view mode is not offered by Firefox. What is Open in Reader View extension? 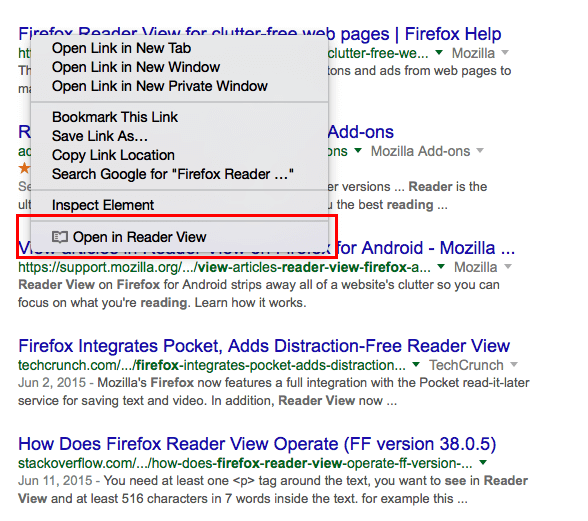 Open in Reader View add a new context menu item to the right click context menu to access Firefox's built-in reader view. What is Firefox's reader view? Firefox for Android has a beautiful Reader View that strips away all of a website's clutter so you can focus on what you're reading. We'll show how it all works. Is it possible to exit from the reader view and go back to the normal view? Yes, just tap the Reader View icon in the address bar. There might or might not be a reader view icon when website is loaded. To switch back to the reader view, use the right click context menu on the webpage (not over any links). Is it possible to customize the way things look in the Reader View? Yes, In Reader View, tap the screen to bring up the controls and then tap the Aa button to change the size of the text, switch fonts or change the theme from light to dark for reading in the dark.